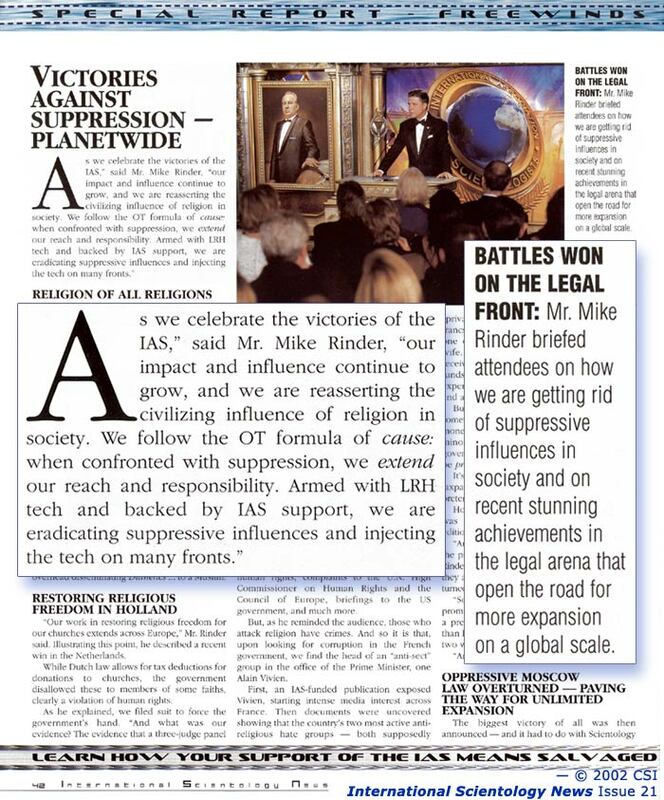 BATTLES WON ON THE LEGAL FRONT: Mr. Mike Rinder briefed attendees on how we are getting rid of suppressive influences in society and on recent stunning achievements in the legal arena that open the road for more expansion on a global scale. 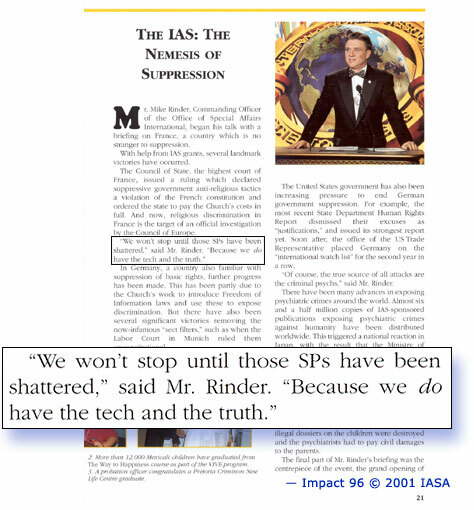 Throughout Scientology’s history, SPs have attempted to subvert the tech and prevent people from moving up The Bridge. 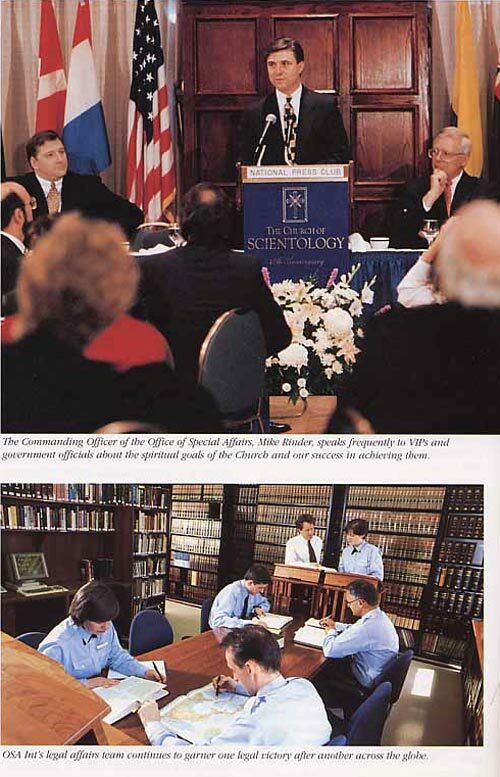 But again and again, in country after country, those who seek to suppress mankind and thwart Scientology’s expansion come up against the one group they cannot overwhelm or beat when they stand face-to-face with the Sea Org. The Office of Special Affairs network is headed by the Office of Special Affairs International and has offices in each CLO around the world. These units are staffed by Sea Org members, because historically, the safety of Scientology has been entrusted to Sea Organization members—because they have a level of dedication and toughness that is necessary to deal with suppression on the fourth dynamic. This team of Sea Org members is achieving victory after victory on the external front through the application of standard LRH tech. There is never any compromise when it comes to protecting the delivery of Scientology in our orgs through the standard application of LRH ethics tech. Being the top of The Bridge, and because of its importance to Scientology and to the rest of the planet, this is particularly true at Flag Land Base. And it was this unreasonable viewpoint which brought about one of the Sea Org’s most important recent victories. The battle centered around a handful of SPs who had waged an unsuccessful campaign to drive the Church out of Clearwater. In the face of Flag’s continued expansion, their efforts became even more frantic. Their suppressive assault began in the mid-1970s when the purchase of the Fort Harrison cut across the plans of local SPs to depress the local real estate market so they could move in and buy up the city cheaply. Reacting to our presence, they pushed through a city ordinance in the early 80s designed to give the city the power to control and manage any religious organization’s finances and operations. Of course, in spite of their efforts to camouflage their bad intentions, it was clearly aimed solely at the Church of Scientology. These officials wanted to be able to move in and take over the Church. In the early 1980s, a Sea Org Command Team fired to form the Office of Special Affairs at the FLB to deal with these suppressives. One of the first actions was to file a lawsuit against the city. This proved to be only the first skirmish in a tenacious, decade-long battle. Eventually, in September 1993, the 11th Circuit Court of Appeals issued a landmark ruling that protects the rights of all religious organizations throughout the United States. The Court blasted the ordinance and ruled that it had been enacted for an improper political purpose. The Court ruled 100% in our favor. They further found that the ordinance violated a portion of the U.S. Constitution which guarantees freedom of religion in America. 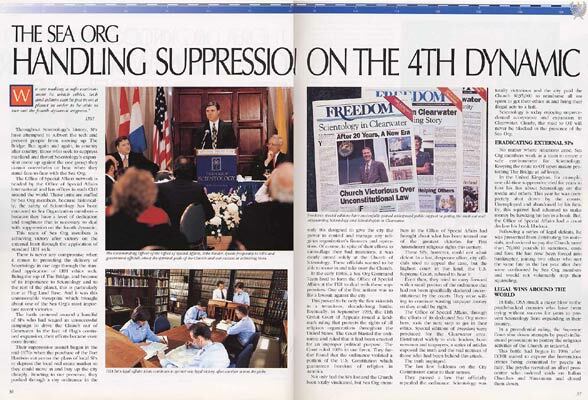 Not only had the SPs lost and the Church been totally vindicated, but Sea Org members in the Office of Special Affairs had brought about what has been termed one of the greatest victories for First Amendment religious rights this century. These SPs, however, could not admit defeat. In a last, desperate effort, city officials tried to appeal the case, but the highest court in the land, the U.S. Supreme Court, refused to hear it. Even then, they tried to carry forward with a small portion of the ordinance that had not been specifically declared unconstitutional by the courts. They were willing to continue wasting taxpayer money so they could be right. The Office of Special Affairs, through the efforts of its dedicated Sea Org members, took the next step to get in their ethics. 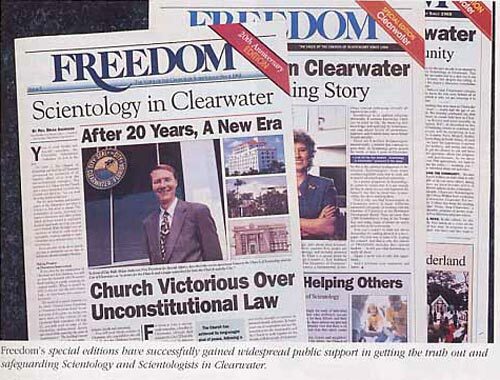 Special editions of Freedom were produced for the Clearwater area. Distributed widely to civic leaders, businessmen and taxpayers, a series of articles exposed the truth and the real motives of those who had been behind this attack. The last few holdouts on the City Commission came to their senses. They passed a law that officially repealed the ordinance. Scientology was totally victorious and the city paid the Church $635,000 to reimburse all we spent to get their ethics in and bring their illegal acts to a halt. Scientology is today enjoying unprecedented acceptance and expansion in Clearwater. Clearly, the road to OT will never be blocked in the presence of the Sea Org. No matter where situations arise, Sea Org members work as a team to create a safe environment for Scientology. Keeping the route to OT open means protecting The Bridge at all levels. 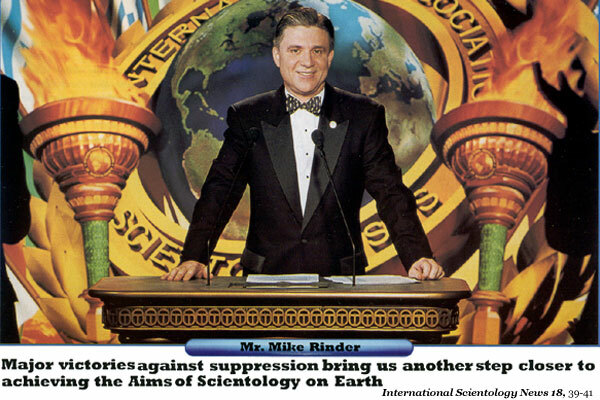 In the United Kingdom, for example, one old-time suppressive tried for years to foist his lies about Scientology on the media and others. This year he was completely shut down by the courts. Unemployed and abandoned by his family, this squirrel had schemed to make money by hawking his lies in a book. But, the Office of Special Affairs had a court declare his book libelous. Following a series of legal defeats, he was prevented from distributing his materials, and ordered to pay the Church more than 70,000 pounds in sanctions, costs and fees. He has now been forced into bankruptcy, joining two others who met the same fate in the last year after they were confronted by Sea Org members and would not voluntarily stop their squirreling. 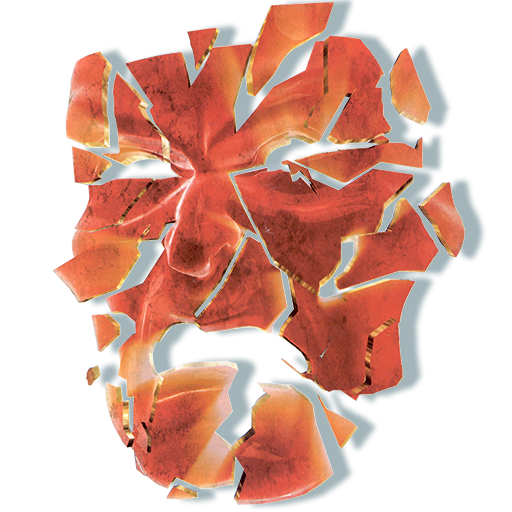 In Italy, OSA struck a major blow to the psych-backed enemies who have been trying without success for years to prevent Scientology from expanding in their country. In a precedential ruling, the Supreme Court shut down attempts by psych-influenced prosecutors to portray the religious activities of the Church as unlawful.